Abstract. About a quarter of anthropogenic CO2 emissions are currently taken up by the oceans, decreasing seawater pH. We performed a mesocosm experiment in the Baltic Sea in order to investigate the consequences of increasing CO2 levels on pelagic carbon fluxes. 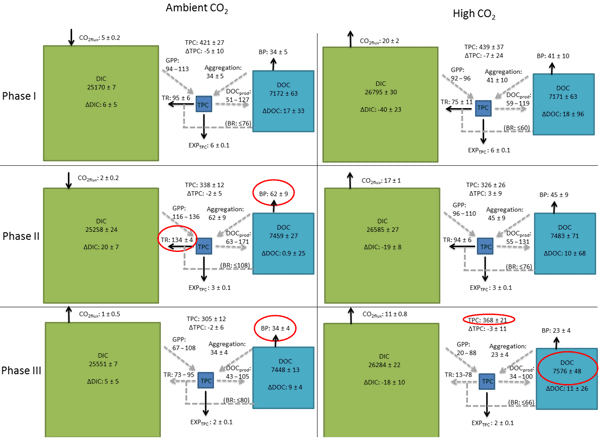 A gradient of different CO2 scenarios, ranging from ambient ( ∼ 370µatm) to high ( ∼ 1200µatm), were set up in mesocosm bags ( ∼ 55m3). We determined standing stocks and temporal changes of total particulate carbon (TPC), dissolved organic carbon (DOC), dissolved inorganic carbon (DIC), and particulate organic carbon (POC) of specific plankton groups. We also measured carbon flux via CO2 exchange with the atmosphere and sedimentation (export), and biological rate measurements of primary production, bacterial production, and total respiration. The experiment lasted for 44 days and was divided into three different phases (I: t0–t16; II: t17–t30; III: t31–t43). Pools of TPC, DOC, and DIC were approximately 420, 7200, and 25200mmolCm−2 at the start of the experiment, and the initial CO2 additions increased the DIC pool by ∼ 7% in the highest CO2 treatment. Overall, there was a decrease in TPC and increase of DOC over the course of the experiment. The decrease in TPC was lower, and increase in DOC higher, in treatments with added CO2. During phase I the estimated gross primary production (GPP) was ∼ 100mmolCm−2day−1, from which 75–95% was respired, ∼ 1% ended up in the TPC (including export), and 5–25% was added to the DOC pool. During phase II, the respiration loss increased to ∼ 100% of GPP at the ambient CO2 concentration, whereas respiration was lower (85–95% of GPP) in the highest CO2 treatment. Bacterial production was ∼ 30% lower, on average, at the highest CO2 concentration than in the controls during phases II and III. This resulted in a higher accumulation of DOC and lower reduction in the TPC pool in the elevated CO2 treatments at the end of phase II extending throughout phase III. The “extra” organic carbon at high CO2 remained fixed in an increasing biomass of small-sized plankton and in the DOC pool, and did not transfer into large, sinking aggregates. Our results revealed a clear effect of increasing CO2 on the carbon budget and mineralization, in particular under nutrient limited conditions. 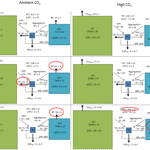 Lower carbon loss processes (respiration and bacterial remineralization) at elevated CO2 levels resulted in higher TPC and DOC pools than ambient CO2 concentration. These results highlight the importance of addressing not only net changes in carbon standing stocks but also carbon fluxes and budgets to better disentangle the effects of ocean acidification. How to cite: Spilling, K., Schulz, K. G., Paul, A. J., Boxhammer, T., Achterberg, E. P., Hornick, T., Lischka, S., Stuhr, A., Bermúdez, R., Czerny, J., Crawfurd, K., Brussaard, C. P. D., Grossart, H.-P., and Riebesell, U.: Effects of ocean acidification on pelagic carbon fluxes in a mesocosm experiment, Biogeosciences, 13, 6081-6093, https://doi.org/10.5194/bg-13-6081-2016, 2016. We performed an experiment in the Baltic Sea in order to investigate the consequences of the increasing CO2 levels on biological processes in the free water mass. There was more accumulation of organic carbon at high CO2 levels. Surprisingly, this was caused by reduced loss processes (respiration and bacterial production) in a high-CO2 environment, and not by increased photosynthetic fixation of CO2. Our carbon budget can be used to better disentangle the effects of ocean acidification.